Monday night late, when we were about to go through the customs declaration to re-enter the US, I saw signage about an app that I had previously downloaded, and how it could make the customs process easier, so I stopped E, scanned her passport and took her photo (I’d done mine before we left the US), and answered the questions it asked. When we got up to the queue for customs, there were hundreds in line to get through the process, there was one in front of me for the mobile line (it’s the same line as diplomats and military personnel) but he was in the wrong line and sent away with someone else within minutes to direct him accordingly. I was apprehensive that perhaps this was too easy and I too was in the wrong line, nevertheless, I proceeded to the desk with E in tow, my cell phone with the app opened and my passports in hand. I asked the gentlemen if I too was in the wrong line, he assured me that I was in the correct place. Seconds later, after assessing what I handed him, he got a very serious look and told me yes, in fact I was in the Wong line. I started to panic before he smiled a huge smile and pointed at his name tag…his last name was Wong. This man made my whole day, his sense of humor at what could have been a stressful part of my day made me smile. 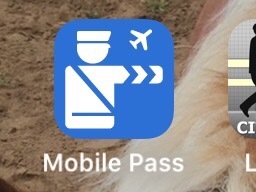 Seriously though, if you travel abroad…get this app! !